After few exhibitions in previous weeks it is nice to get back to work. 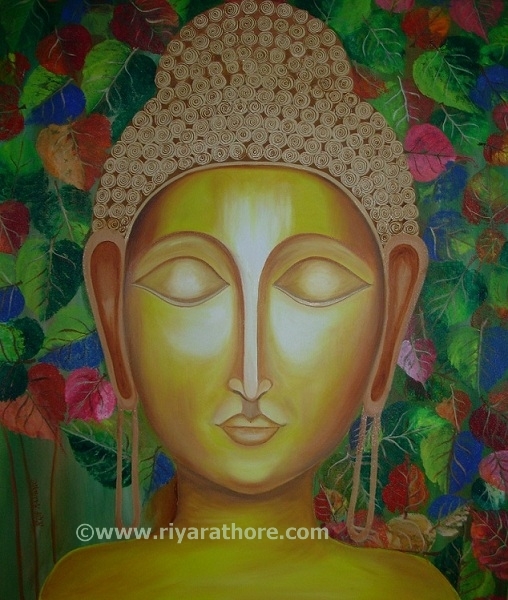 Here I present the latest creation using mix media (Oil / Acrylic) on canvas a painting of Lord Gautam Buddha. Hope you all will like it. The word 'Buddha' is a title and not a name. It means 'one who is awake' in the sense of having 'woken up to reality'. Buddha, means 'the enlightened one'. Gautam Buddha was one of the greatest religious teachers that the world has seen. His teachings expounded in Buddhism, are immensely popular in India ,Thailand ,Burma, China, Japan and other South Eastern Countries. Lord Gautam Buddha gave emphasis on the purification of mind, heart and ultimately, soul by following the Eightfold Path, the Four Noble Truths and the Five Perceptions. This path included the right speech, understanding, determination, deeds, efforts, awareness, thinking and living. As per Buddhism, if one follows these paths, one could overcome desires, which were the reason for all the grieves and miseries. Today's world can be a better place to live if we try to follow his preachings. Great Painting, looks very serene! This is very well done. The highlights look like polished metal. Nice effect. Good control of the media. Thanks a lot Stan .. Thanks Riya,for your nice comments.I do have great interest in music as well.I play Spanish Guitar,Harmonica and Flute.The background of `Lord Gautam Buddha`is so impressive...Best of Luck. Riya how are you and this works are amazing,wow...all your works are well done and unique.